Fill your borders with colour, grace and elegance. Create an eyecatching display in a sunny border bring colour to your patios or brighten up a dull corner. 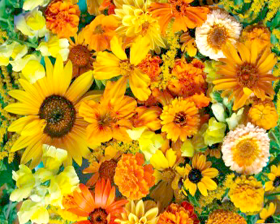 To help you make the most of your borders or containers, we have grouped together annuals in yellow and orange shades that will keep flowering from spring to the frost and help you to achieve a balanced flowering display.